Ariel Sharon Remembered As Man Of War And Peace : The Two-Way The former Israeli leader died Saturday. He was 85. Vice President Biden called Sharon an "indomitable bulldozer." 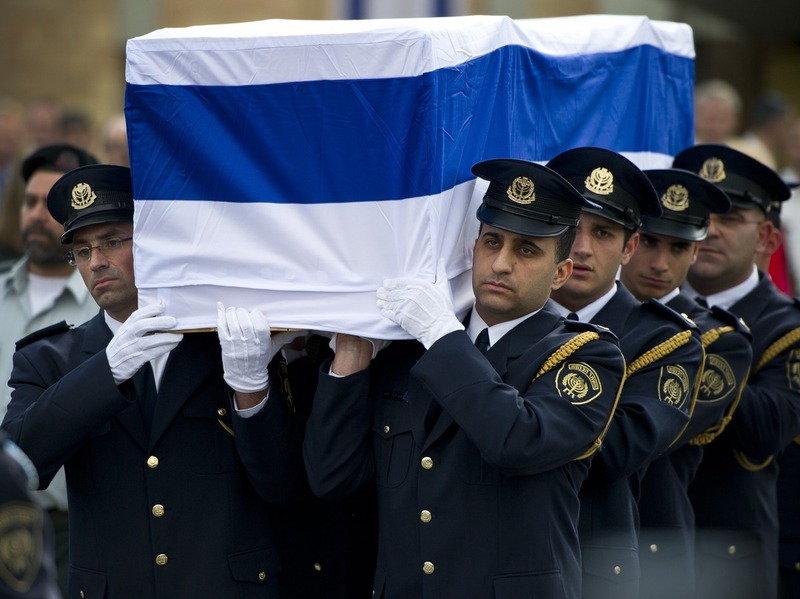 Sharon was buried Monday on his ranch in southern Israel. Israeli soldiers carry the coffin of former Prime Minister Ariel Sharon on Monday in Jerusalem. "The idea that he changed from man of war to a man of peace," is mistaken, former British Prime Minister Tony Blair said during a memorial service at the Knesset, Israel's legislature. "He never changed," Blair continued. "His strategic objective never wavered. The state ... had to be protected for future generations. When that meant fighting, he fought. When that meant making peace, he sought peace with the same iron determination." Sharon, 85, died Saturday. He had been in a coma since suffering a stroke in 2006. Vice President Joe Biden, who is heading the U.S. delegation to the services for Sharon, also spoke at Monday's memorial. He called Sharon an "indomitable bulldozer. ... The security of his people was his unwavering mission." As NPR's Emily Harris reported on Morning Edition, in 2005 Sharon "pulled Israeli soldiers and settlers out of the Gaza strip. ... But Palestinians remember Sharon as a man of war." "Amid final prayers, Mr Sharon's coffin [has been] placed in a plot at the Sycamore ranch he owned near Sderot, close to Gaza," the BBC writes. "He lies beside his wife Lili, who died in 2000."